With lard as his medium, a prominent Chicago sculptor, Charles Umlauf, recently executed one of his strangest commissions. The result of his labors was a piece of statuary from which a big pig and a little one grinned at visitors to an international livestock exhibition. 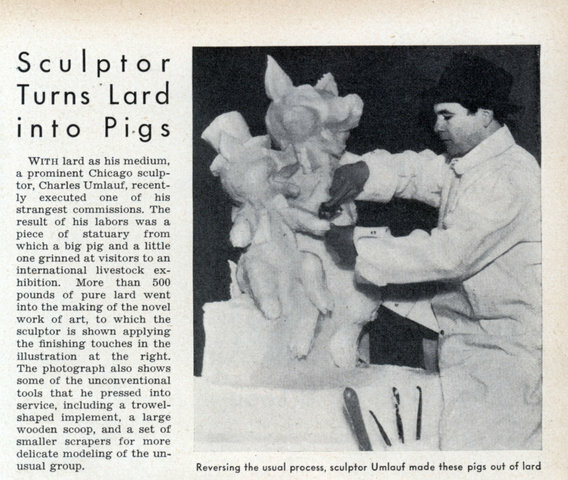 More than 500 pounds of pure lard went into the making of the novel work of art, to which the sculptor is shown applying the finishing touches in the illustration at the right. The photograph also shows some of the unconventional tools that he pressed into service, including a trowel-shaped implement, a large wooden scoop, and a set of smaller scrapers for more delicate modeling of the unusual group.